Dubai: Robots will soon help motorists detect faults in their cars as the Roads and Transport Authority (RTA) goes high-tech with its vehicle inspection system. Unveiled at the 38th Gitex Technology Week on Sunday, the vehicle inspection robot is among a series of smart initiatives launched by the RTA, designed to make life easy for road users. Currently in a pilot phase, the robot will be installed at petrol stations and other public locations for access of the motorists. “In the first phase, we will install these robots at petrol stations so that people can use it to detect faults in their cars and avoid going through any breakdown. This will also save people from going to workshops to check faults,” said Jamal Al Sa’adah, director of RTA’s Vehicle Licensing Department. The robots will interact with motorists directly without any intervention from any RTA staff, allowing motorists to follow a few simple steps to access the fault detection service. After choosing for the fault reading service on the robot’s interactive screen, the robot will direct you to insert a debit or credit card for payment, once payment is processed a slot will open in the machine and the robot will direct you to remove a dongle which will have to be inserted in the car for the robot to diagnose the problem in the vehicle. “Once the dongle is inserted the robot takes a few minutes to read the car’s system and find faults. Once that is done it will direct the user to remove the dongle and put it back in the robot to analyse the data. It then asks the user for an email ID where the certificate of the diagnosis is sent,” said Al Sa’adah. He added that in the next stage, the RTA plans to use the robot for the annual vehicle inspections. Driving around on an autonomous taxi without a driver on the wheel is likely to happen in Dubai sooner than you imagined. The RTA on Sunday unveiled the self-driving vehicle at the Gitex Technology Week, demonstrating the cars’ capabilities. To be on trial at Dubai Silicon Oasis, the Mercedese E-Class vehicle with full autonomous features, will initially run on a dedicated route, albeit without passengers. According Khalid Al Awadi, director of RTA’s Automated Collection System, the vehicle is designed to operate at 35km/h during the trial phase to ensure all road users are safe. With multiple cameras and sensors, the vehicle is capable of detecting obstacles around it and operate in all traffic situations. The prototype vehicle will be tested over the next three months taking it through different safety and security requirements before allowing trials with passengers. Dubai residents can now get answers to all their RTA related queries or process several of the RTA’s services through a virtual assistant — Mehboob. 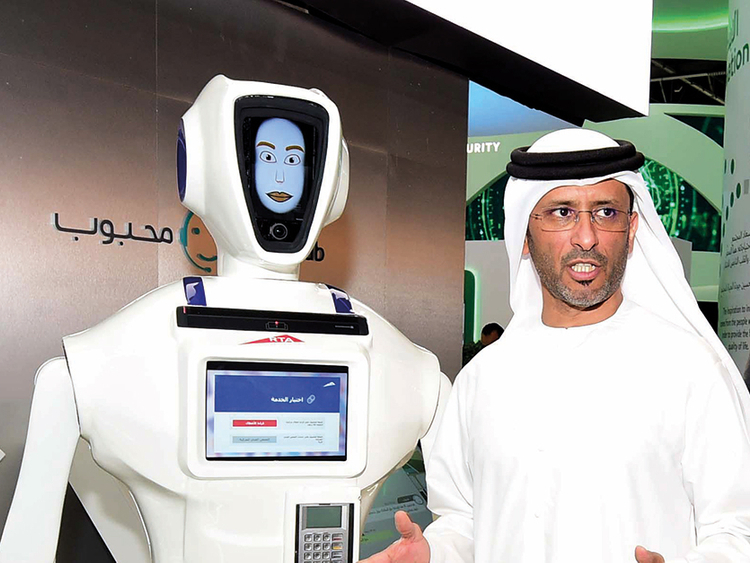 The Aritificial Intelligence-based platform, which is currently live on the RTA’s website www.rta.ae, will also be available on the authority’s mobile app from next month, while Mehboob the robot will also be available at the RTA’s customer care centres soon. Capable of interacting with hundreds of people at the same time, Mehboob can be reached to inquire about metro and bus timings, book taxis, pay fines as well as process vehicle registration and other licensing services. More than 90 services are currently available with Mehboob and more services will be added continuously. “it is like raising a baby. Mehboob is growing every day with more services and more capabilities and he is improving and getting smarter with passage of time. He will soon be able to interact with customers will most of RTA services,” said Mohammad Al Khayat, director of RTA’s Smart Services Department. Nol Plus is a loyalty programme which the RTA launched on Sunday, allowing commuters to earn rewards with every dirham spent on public transport. “Nol Plus is the first of its kind public transport loyalty programme in the region, where commuters can earn one point with every dirham spend travelling on Dubai Metro, buses and tram,” said Al Awadi. To be part of the reward programme the commuters need to register at www.nolplus.ae and earn 500 bonus points. Registration for the programme could be done in three easy steps of creating an ID, linking your Nol card with the account and start enjoying the benefits. The benefits or rewards could be redeemed in restaurant vouchers, amusement centre tickets, entertainment packages, etc.